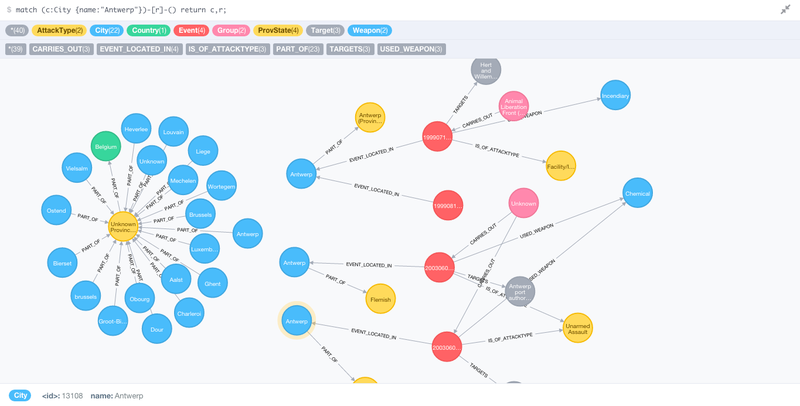 In part 1 and part 2 of this blog series, I talked about how we at Neo4j are seeing more and more customers using graphs to model, store and manage their Person-Object-Location-Event relationships. 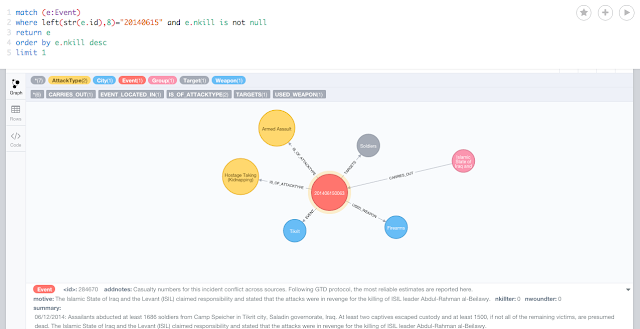 It's a really great use case, and I have been toying with the Global Terrorism Database (GTD) to try and illustrate what graphs bring to the table there. 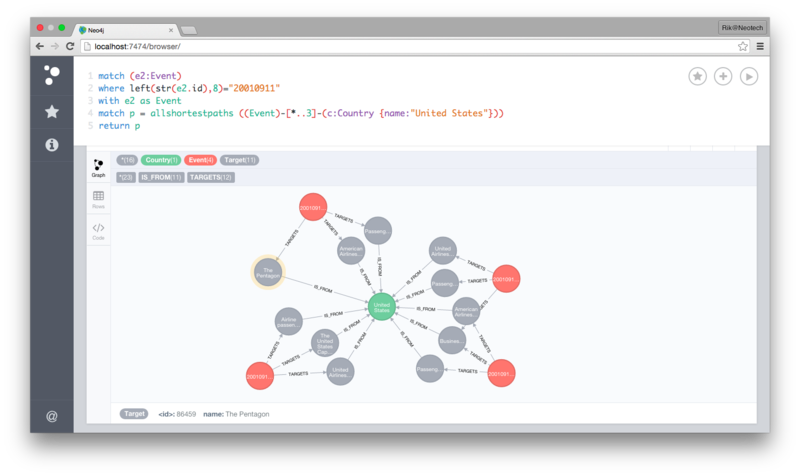 In the first post I explained some of the concepts, and in the second post I was able to import the GTD into Neo4j without too many hickups. So now, in this third and final post, we are ready to do some POLE querying. Excited to see what we can find out. You will find all of these queries on Github, of course. But let's take you through some of my experiments, one by one. 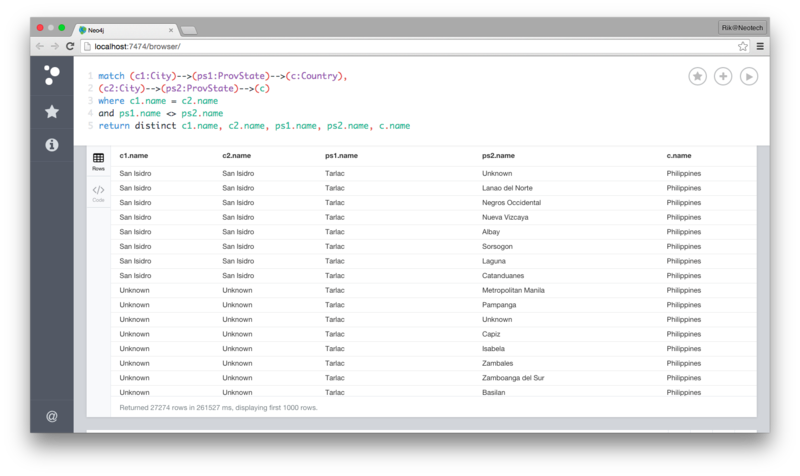 Seems like there are multiple "Antwerps" in the Database, and that is a bit of a pity. Then I unfortunately get this HUGE resultset with 27274 rows of essentially badly entered data. As part of this blog series I did not have the time or inclination to try and correct the data in any way, but it feels like we could do some data cleansing there. Clearly Iraq and Pakistan are not the safest places, but I was actually surprised to see the UK, the USA and the Philippines in the "top 10". Interesting. Then of course you can also look at some interesting stats. So it's pretty darn clear that June 14th and June 15th of 2014 were pretty darn special. Let's take a closer look. Now I don't want to bore you with too many details, but... this one is quite amazing: the Camp Speicher massacre, committed by ISIS in Tikrit, Iraq. 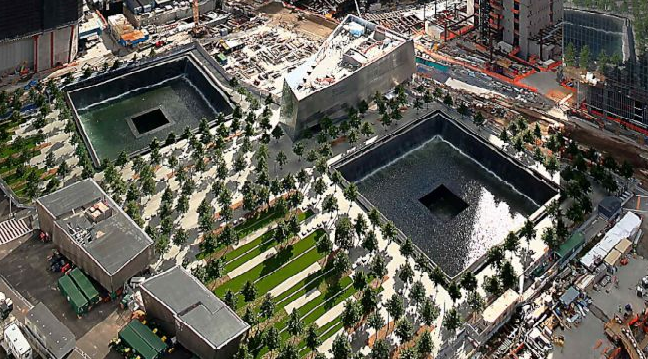 The story is unbelievable and sad, as told by one of its survivers here and here. Warning: shocking stuff. After that depressing find, I actually started to dig around with some specific attacks in mind. So let's look at these. So the first one I decided to take a look at - not sure why, but anyway - was the Oklahoma City Bombing. I don't know that much about that event, but I do vividly remember the pictures on TV and the unbelievable story behind it - as if it was taken from a road movie. So let's look that one up. Now last but not least, let's see if we can find interesting connections. Because of the data quality issues that we uncovered above, the connections highlighted here may not be perfect or that interesting, but the principle I think could be super interesting in a true, well-maintained POLE database. 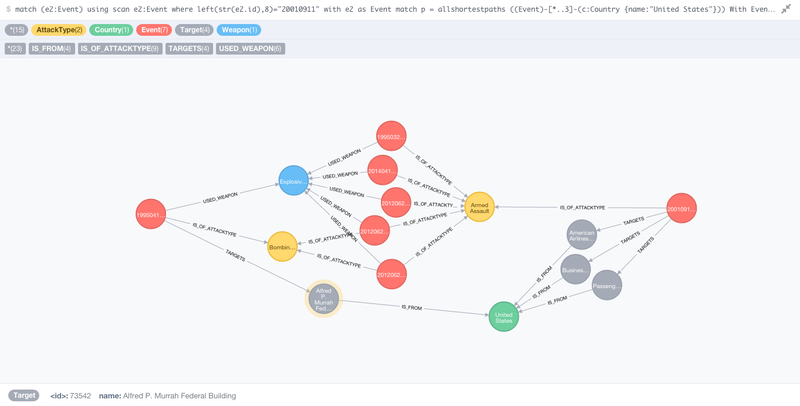 As you can see below, you do get an interesting view and a number of "suggested" links between different events - look at the "similar" events in the middle for example. No doubt that in a true POLE database application, that would be a great source of inspiration for further exploration. 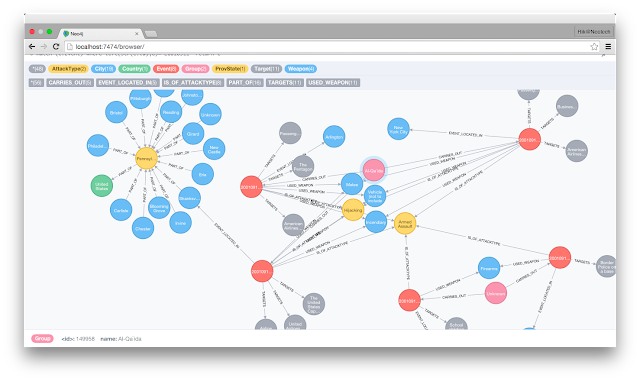 That's about it what I have to share on my journey with POLE databases, the Global Terrorism Database and Neo4j. I hope it was useful for you - I certainly found it a very interesting excercise. As always - feedback and comments would be very welcome.